The Texas Collection staff decided to have a bit of fun over the summer and created video trailers to introduce you to some of our favorite collections. 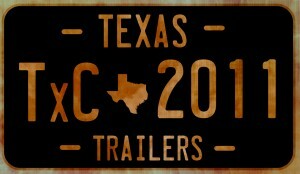 Our Texas Trailers are up on YouTube for your viewing pleasure. We’ve put together short movies about western pulp fiction, panoramic photographs, promotional literature, the Adams-Blakley collection, and Jules Bledsoe archival materials. We hope you’ll enjoy this look into the stacks and vaults here at Carroll Library. Leave your comments below! In the days before Decepticons and Autobots, Viopticons, Stereopticons, and the other members of the Magic Lantern family thrilled audiences in darkened rooms. While perhaps difficult for us to imagine from our movie-savy perspective, for many years before the advent of cinema people went out to the “picture show” to look at slides. Theatergoers were captivated by the magical effect of these projected images. Eventually, enterprising showmen added musicians and sound effects to enhance the show–even animating the images by various mechanical techniques. During the late 18th and 19th centuries, phantasmagoria shows left audiences shivering with terror for fear that ghosts and demons had been set upon them. The Texas Collection recently uncovered two boxes of glass slides manufactured by the Victor Animatograph Co. of Davenport, Iowa. These slides were 2 x 2.25 inches and were shown on the Viopticon, the first truly portable stereopticon. The Vioptican projected images using a brilliant carbon arc lamp. 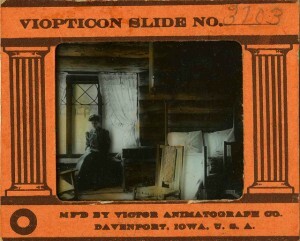 Sets of Viopticon slides were available for purchase or rent as illustrated lectures. Our two sets of slides were used by Baylor history professor Francis Gevrier Guittard in the early 1900s. One set contains hand-tinted photographs of Yellowstone National Park, and the other set depicts important events from the life of George Washington during the American Revolution. While these slides were not part of a spectacular Magic Lantern theater experience, they represent an early example of educational technology as manufacturers began to promote the use of projectors in the classroom. The inventor of the Viopticon, Alexander Victor, lived a fascinating life. Born in Sweden in 1878, his first career was as a magician and showman working with the renowned Stephanio. Victor had obtained an early Lumiere Cinematograph and added projected pictures to Stephanio’s show, much to audience delight. After Stephanio’s death, Victor continued touring with his own troupe, but a warehouse fire in Ohio destroyed his entire collection of magical props and his career as a performer ended. You can see a slideshow of these Viopticon images and imagine yourself in an early 20th century classroom by visiting our flickr page. For the Yellowstone slides click here, and for George Washington, click here. One of our recent experiments over on Flickr is a gallery of our favorite images of Waco. We searched through hundreds of photographs posted on the Flickr photosharing site, and found some terrific shots taken by folks who live here or were visiting the area. These photographs aren’t owned by The Texas Collection; instead they represent a virtual collection of people’s creative responses to Waco. You can find information on individual photographers by clicking on the images. We hope you’ll enjoy the show! Updated June 27, 2012: You’ll see something a little different in this slideshow now–instead of just favorite Waco photos, we’re starting to add favorites from other special collections too that we find on Flickr. Enjoy a trip through all kinds of interesting places! If you find yourself in Waco, come by and see us at The Texas Collection. We’re located in Carroll Library on the Baylor University campus. Visit before October 15th, and see our current exhibit: William Cameron Park: 100 years. You can learn more about the display on our Flickr page. Just click on any image in the slide show above to continue on to Flickr.